[OFNC] activities.”Like all Ottawa Field-Naturalists’ Club members, the Macoun Field Club has a standing subscription to Trail & Landscape (T&L). Even though it is obviously meant for a reader with general interests in nature, T&L still seems to be underappreciated — as with the OFNC’s other, more technical publication (The Canadian Field-Naturalist). Through this webpage, I hope to encourage subscribers to read more carefully to find the things that will matter for them. Leaves three, let it be? This familiar adage gives too broad a warning — applied uncritically, it warns uselessly against trilliums, wild strawberries, and unlucky clovers. Truly, the only sensible thing to do is learn what Poison Ivy looks like. Read about it, study photos and drawings, and identify it for yourself wherever you go. Learn to notice it when it’s easy to see, learn to look for it when it’s hard. Learning like this demands effort. In the Spring 2007 issue, Connie Clark recounts “a doozy of a case” that had her confined to home. She used her enforced confinement at home to read up on the cause of her troubles, and has now shared what she discovered. “Some of the information seemed to be contradictory,” she says. Even botanists have disagreed about which family to place it in. Sufferers disagree even more on what to do about the rash and blisters. The one thing that has become clear over the years is that the irritating oil is water soluble, and if dealt with immediately, it can be washed off with water alone. But you have to see the plant first, and it’s seldom out in the open the way most drawings show it. 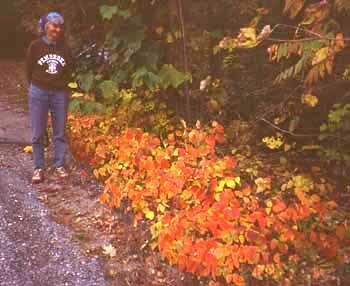 Connie’s photos, while sharply focused, show Poison Ivy in its usual state — half in sun and half in shadow, mixed in with other foliage, obscured by a clutter of fallen leaves and rocks. In October it can be so gorgeously coloured (as shown here, along my own laneway) that people may gather it for autumn boquets, and after that it’s just bare sticks and vines that one must learn all over again. Many people figure they’re immune, but no one can count on this happy state lasting forever. Your naturalist’s learning will be appreciated if you can keep other, less fortunate people out of Poison Ivy patches, and if you ever spot this plant included in someone’s buring brush pile, you could save yourself the especially dangerous exposure of the smoke. The highlight of this Winter 2007 issue, for me, is the 21-page article on butterflies of the Ottawa district (Ross Layberry’s “Butterflies of the Ottawa District: 103 species . . . and counting”). Not that I’m so very much involved with this group of insects (see my pages on Leatherwood Treehoppers and Lasius ants), but whenever I get a good enough look at a butterfly around home, I first identify it with my copy of “The Butterflies of Canada,” and then zero in on its local status with this same author’s T&L article from 25 years ago (Vol. 16, pages 3-59). The current, finely illustrated article is an important update on the more significant changes that have been documented in selected species around Ottawa over the past quarter century. This well-known species appears to be declining in numbers throughout eastern Ontario. It used to always be the first and last butterfly I would see each year at home, but I have not seen one there since 2000. I no longer know anywhere that I can go and confidently expect to see one, and I have not seen the large colonies of larvae for about twenty years; I used to see them regularly. Status should be revised to uncommon. 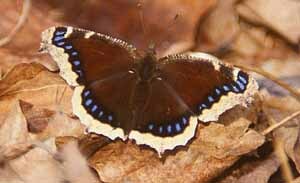 You don’t have to be very old to have memories of this first spring butterfly, with each one patrolling its own woodland glade and speedily chasing rivals up to the treetops and beyond. Macoun Club members of the 1990s will certainly remember them from our Study Area and from Pakenham. I was aware that I personally hadn’t been seeing them over the last couple of years, but thought that was me, not them. Are Mourning Cloaks still part of your springtime? All images donated by Macoun Club leaders, members, parents and friends. Created by Robert E. Lee on Jan. 29, 2007. Additions April 11, 2007. Coding revised June 29, 2016.